You can use our services in limited version for free !!! 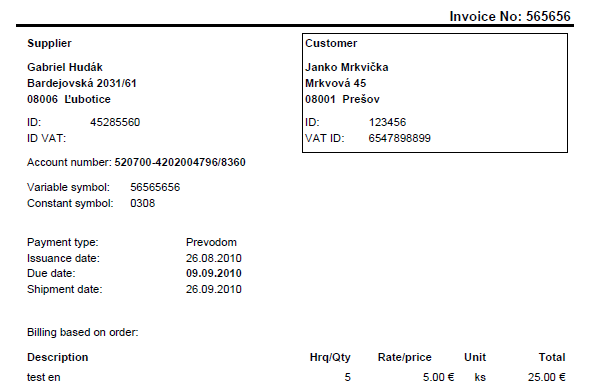 Our goal is to offer you with an easy and quick way of creating, managing and printing invoices from your browser. Who are our services for ? Our services are aimed at freelancers and small companies who do not use any accounting software but need a way to create invoices. Insted of creating invoices in software like Microsoft Word ord Excel our services offer you and easy solution usable directly from your browser. Yes, the limited version is really free, but it contains some limitations. If the free version is very limited for you, you can buy the payed version at any time. More information about versions differencies and prices is included in the section Prices. Using our services is really simple and intuitive. After you log in you will see all the important information. Everything is one place. You do not have to fill in your customets data all the time, you just define a customer in the first step. You fill in basic information and just you them when creating and invoice. When create and invoice you simply select a customer, fill in all the required data, add some invoice items and the invoice is ready. 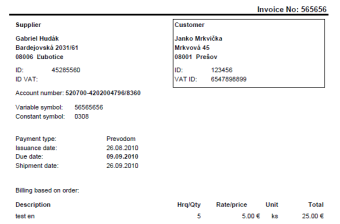 After you close the invoice you can print it or send to an email. Do not hesitate and	register , the basic version is available for free! Copyright © 2011 - 2019 Media Plus, s.r.o. Hosting Ensures Platon Technologies, Ltd.